This Explosive package is the ultimate slamming experience! You are all set for a fantastic training session of shoulder mobility, fast explosive moves and powerhouse feats of strength! Add in the 3" Mini balls for hand eye coordination ball tosses, quick release drills or tissue release for a nice cool down. 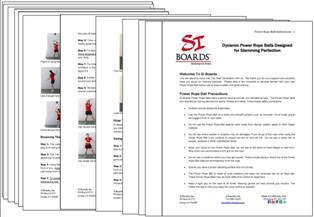 This is a great package when working with multiple clients and classes. The 5" Small Rope Ball is fantastic for your shoulder mobility warm-up. Use one to wake up your full shoulder swings with a light and compact weight. Use two in complex motions for a greater chest and back strength. Start your double trouble slams and get your hip drive activated before moving to the larger Rope Balls. 6.5" Medium Rope Ball is perfect for fast and strong swings with complex sequences. A great size and weight to carry your momentum without overpowering you or feeling like you need more resistance. Make an impact on every rep as you muscle this weight around and then quickly wind up and re-strike. A perfect weight for engaging all muscles in constant reps to build strength and endurance. When you are ready to fully engage into powerful slams the 8.5" Large Rope Ball will never let you down. Put your warm-up and coordination training to the test with a heavy slam and equally responsive rebound. You will have to work hard to keep your footing and control the eccentric pull. A great size and weight for working on complete body control. Use the 3" Mini Balls for added hand-eye coordination and quick releases to test your ambidexterity. Bounce and catch in patterns or throw for fun for accuracy. The 3" Mini Balls are great for trigger point release and tissue rolling after your explosive training session. Come and join me at the concrete playground. I'll bring my suitcase filled with this Explosive combo of our Power Rope Balls. I absolutely love having all of these options. A sample training session would start with the 2 5" Small Rope Balls for shoulder mobility. I start with one singe arm sequence and then add the double trouble double shoulder moves to fully open my chest and thoracic extension. Then I use the medium 6.5" Power Rope Ball and work on complex sequences slamming and pivoting against the wall. To get better hip drive I take the Large 8.5" Power Rope ball and focus on slower but full strength moves with full body extension. I rep between the 6.5" and 8.5" Power Rope Balls. And finally I finish with some hand eye coordination with our Mini 3" Balls and work on shoulder range of motion. A perfect day at the park! Check this out! Afternoon pump from Andrew who gives us an awesome comparison and testimony on our Rope Balls. Big time thanks! #Repost @fitnessbyandrewllc with @repostapp. ・・・ A while ago I got a post from someone that asked me why I liked the @siboards rope balls instead of some of the other rope balls that are out there. So I thought I would show a quick comparison between a @siboards 12.5lb rope ball and a 10lb PowerSystems rope ball. To be clear I do like them both....but the @siboards ball is a SOLID ball and its rebound forces you to stay engaged and it allows you to work concentrically and eccentrically, in other words you will feel the slam but you will still be working against the rebound, you will simply WORK HARDER. With a hollow rope ball you will have to accelerate on the slam, however it's bounce does not force you to stay engaged. The hollow ball will at some point crack or break, and we abuse these @siboards boards and they seem indestructible.